While North Norfolk bares little comparison to Bordeaux or Champagne, two sisters believe their proximity to the coast, the local climate and a growing demand will make their families’ arable farm ideally suited to grape production. Abby Kellett finds out more. Laura Robinson has converted four hectares of family farm to grow grapes. Sisters Laura and Samantha Robinson have bitten the bullet and gone for a small but emerging trend. 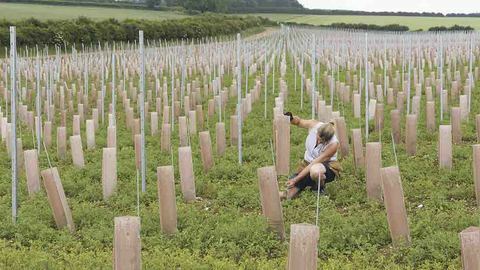 In response to a growing demand for good quality English wine, the pair decided to plant 17,000 vines last spring on their father’s farm in North Creake, Norfolk. This forms part of their ‘10-year vision’ with the ultimate goal of producing a range of own-label wine in a custom-made winery, running alongside a cafe and restaurant. The site, known as Burn Valley Vineyard, covers four hectares (10 acres) which would have otherwise been destined for arable production had the sisters’ father, John not proposed a more exotic business venture. But, as she admits, the challenges came after the idea was formed. “It is all very well growing grapes but you need a market to sell them to. “Our location really swayed it for me. Firstly because of our proximity to the coast, which is only three miles away, we have a popular and wealthy market right on our doorstep; lots of villages with high footfall and plenty of pubs and restaurants,” she says. With grapes harvested from year four onwards, it will be some time before the sisters can quench their thirst with their first drop of wine. “It will be four years before the first grapes are ready to harvest. We may get a small crop before then but you do not want to push the vines too much. “In the first few years you want the vines to put all their efforts into growing really deep roots and a really strong structure which can hold lots of grapes. Therefore it could be eight years before the sisters get any return on their investment of £150,000, which has gone into buying specialist equipment to fit 2.2-metre (7.2ft) rows, infrastructure and labour. The sisters plan to supply a range of wine, from still to sparking, white to red. From a management perspective, this provides multiple benefits. Vineyard consultant Chris Hatto, who has been assisting with the project, says: “The beauty of having several different varieties is they will ripen at different times so you end up with a staggered harvest. Long-term, the sisters plan to process and bottle the wine on-farm themselves but, in the meantime, grapes will be sent to a winemaker to be processed. To process and make the wine, they predict it will cost about £1.80 per bottle. Added to the cost of production and tax, they anticipate the overall cost of producing a bottle of wine will be about £3.50 for still and £6 for sparkling. “I want to create a medium-to-top-end product and we will be looking to sell the still wines for £12.50,” says Laura. Knowing which field to set aside for the venture was an easy decision, largely driven by soil characteristics and geography, says Laura. “The field is south facing. It is one of the poorest fields on-farm in terms of arable production but it is free draining which is good for vines. And with the coast so close, frost damage should be minimal during winter months. But the site is not without its problems. Soil magnesium levels are fairly low and, since vines require more magnesium than the average cereal crop, plants will require regular topping up. Controlling crop growth is another challenge, which Chris foresees. He says: “Nitrogen is a bit of a curse really. You need nitrogen to get the vines growing in the first couple of years but then, as most vines grow vigorously, too much nitrogen sends them crazy. “If the leaves are growing too much the flowers, which are deteriorating, will wilt because they are putting a lot of energy into growing. If you let vines get too big, they will shade each other. In order to keep growth under control, the vines require regular pruning through the year, a job which is extremely labour intensive. Chris says: “Most people think there is nothing to do, but winter pruning is one of our busiest times. You have got tonnes and tonnes of old prunings to take away. Low rainfall is key in growing a successful vineyard, says Chris, along with warm temperatures and minimal wind. “We are quite dry here. We may be a degree off the south coast in terms of temperature, but we get a lot of sunshine hours. The new business venture comes at a time when the market for English wine is booming. "When we get the first bottle of wine I do not think I will believe it's ours. But after all the years of hard work which will have gone into making it, I just hope we like it"
“There is now a demand for good quality English wine when there wasn’t before and many are willing to pay a premium for a wine which is produced locally,” says Chris. 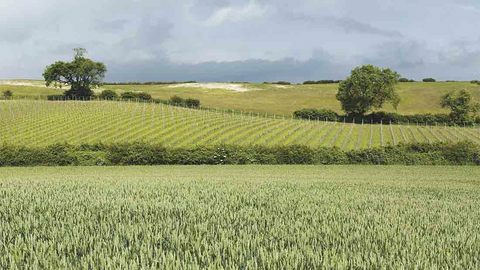 Consequently, the vineyard area in England doubled between 2007 and 2013, increasing to almost 2,000ha (4,942 acres) according to Laura, who expects this to grow to 3,000ha (7,413 acres) by 2020. A better understanding of how to select varieties which will suit the UK climate has contributed to the upsurge in wine production, he says. Variety selection has also been driven by the development of disease resistant varieties, which require fewer fungicide applications. At Burn Valley Vineyard, several of these varieties have been planted. “On this site, we are growing Rondo and Regent which both have disease resistance and do not require heavy spray programmes. “So, instead of doing 10 passes with the sprayer each year, you may only have to do three on some varieties or none in others, depending on the year,” says Chris. One of the most significant changes which has helped boost UK wine production is the climate, which is now much more comparable to grape growing regions across the channel. “The climate is better than it used to be, climate change has helped. 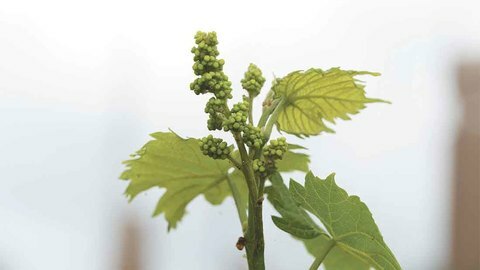 “The temperatures in England now are similar to what they used to be in Champagne in the 1980s, whereas in Champagne it is getting too warm to grow certain varieties. “As well as being able to grow more varieties, the rise in temperatures effectively lengthened the growing season by about three weeks, so we are still able to harvest as late as November,” says Chris. Looking forward, it is clear the sisters are in it for the long haul, not least because the vines have a lifespan of 25-30 years. “This is a family operation and something for the future. The life of the vines means they will be there for the next generation as well if they are interested. “When we get the first bottle of wine I do not think I will believe it’s ours. But after all the years of hard work which will have got into making it, I just hope we like it.